Learn all about Florence Nightingale and her revolutionary nursing work in this children's biography. 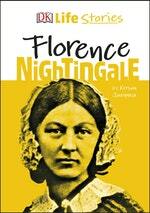 In this biography, discover the fascinating story of Florence Nightingale, who cared for British soldiers during wartime as the "Lady of the Lamp." Florence Nightingale was a pioneer of nursing at a time when women were discouraged from working outside the home, especially in the field of science. She saved many lives both on and off the battlefield through implementing a new standard of medical care, and by leading groups of nurses to improve conditions. In this biography book for kids ages 8-11, learn all about the inspiring story of Florence Nightingale - social reformer, statistician, and mother of modern nursing who bucked the social norms of her day and changed the world. Love DK Life Stories Florence Nightingale? Subscribe to Read More to find out about similar books.